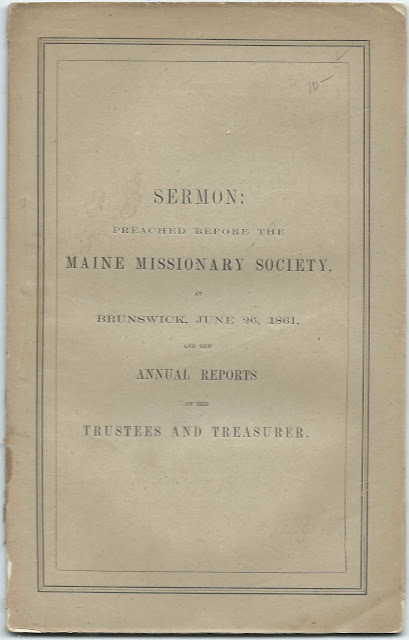 Included in a booklet entitled Sermon Preached before the Maine Missionary Society, Brunswick, June 26, 1861 and the Annual Reports of the Trustees and Treasurer is a list of the Maine towns with missions supported by the Maine Missionary Society, as well as the ministers and laypeople who ministered to them and interesting remarks about many of the missions. The booklet, which measures about 9" by 5-3/4", was printed in 1861 by Stevens & Sayward at Augusta, Maine. Because the entire booklet is provided online by the Yale University library, I've scanned only a few images. The towns are numbered, with several pages of correspondingly numbered remarks. 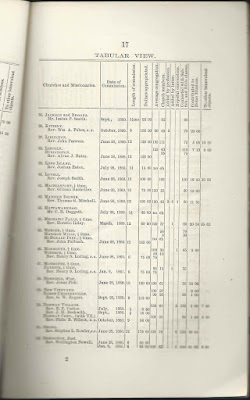 Refer to pages 20-26 in the online version of this booklet offered by the Yale University Library. There's interesting genealogical content in the remarks. B Belfast, North Rev. Truman A. Merrill, s.s.
Brownfield and Hiram Rev. John Boynton; Rev. Josiah G. Merrill, s.s.
Cornish Rev. Albert Cole, s.s.
Denmark and Sweden Rev. Amasa Loring, s.s.
Dexter and St. Albans Rev. 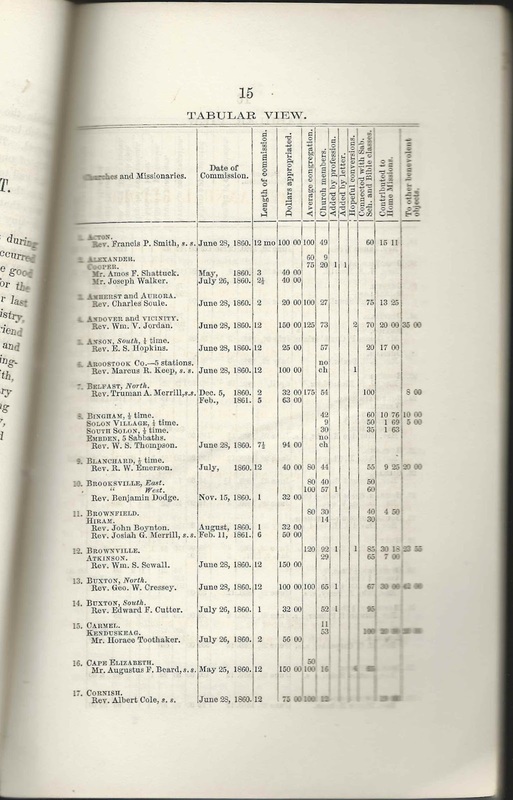 Daniel Sewall, s.s.
F Fayette - 1/4 time, and Monmouth - 3/4 time Rev. Henry S. Loring, s.s.
Fort Fairfield, Washburn, Littleton, Monticello, Presque Isle Rev. Elbridge Knight, s.s.
Golden Ridge, Patten, Island Falls Rev. 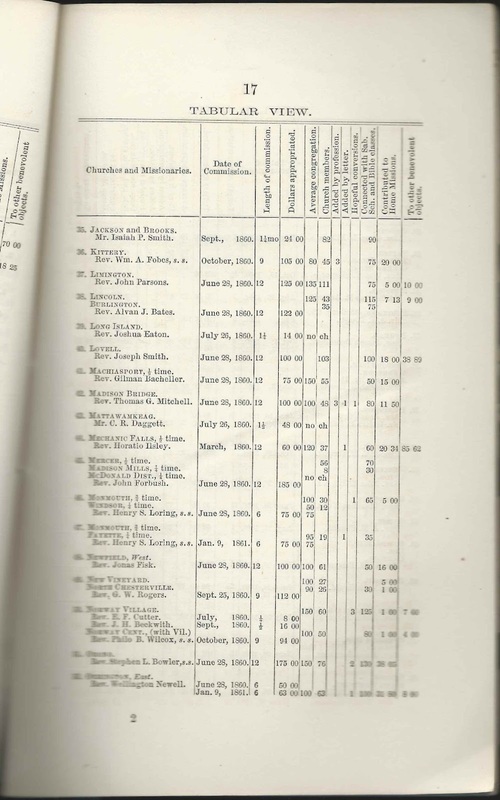 William T. Sleeper, s.s.
Guilford - 1/2 time, Abbot - 1/4 time; Sangerville - 1/4 time Rev. John A. Perry, s.s.
H Harrison, 1/2 time Rev. 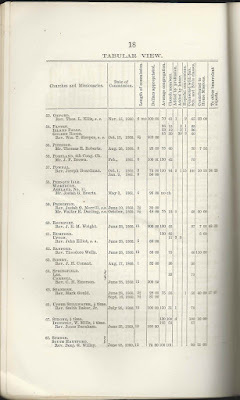 Edward Palmer, s.s.
Hiram and Brownfield Rev. John Boynton; Rev. Josiah G. Merrill, s.s.
Houlton and Linneus Rev. E. G. Carpenter, s.s.
Island Falls, Patten, Golden Ridge Rev. William T. Sleeper, s.s.
Linneus and Houlton Rev. 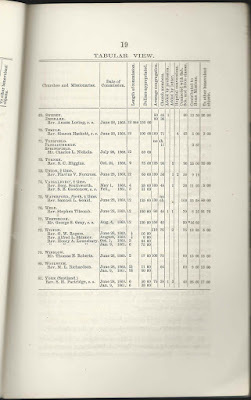 E. G. Carpenter, s.s.
Littleton, Fort Fairfield, Washburn, Monticello, Presque Isle Rev. Elbridge Knight, s.s.
Monmouth - 3/4 time, and Fayette - 1/4 time Rev. Henry S. Loring, s.s.
Monmouth - 3/4 time, and Windsor - 1/4 time Rev. Henry S. Loring, s.s.
Monticello, Fort Fairfield, Washburn, Littleton, Presque Isle Rev. Elbridge Knight, s.s.
Norway Center (with Village) Rev. Philo B. Wilcox, s.s.
Oxford Rev. Thomas L. Ellis, s.s.
Patten, Island Falls, Golden Ridge Rev. William T. Sleeper, s.s.
Presque Isle, Fort Fairfield, Washburn, Littleton, Monticello Rev. Elbridge Knight, s.s.
Rumford and Upton Rev. John Elliot, s.s.
St. Albans and Dexter Rev. Daniel Sewall, s.s.
Stillwater, Upper Rev. Smith Baker, Jr.
T Temple Rev. Simeon Hackett, s.s.
Upper Stillwater - 1/2 time Rev. Smith Baker, Jr.
Upton and Rumford Rev. John Elliot, s.s.
Vassalboro - 3/4 time Rev. S. B. Goodenow, s.s.
W Washburn, Fort Fairfield, Littleton, Monticello, Presque Isle Rev. 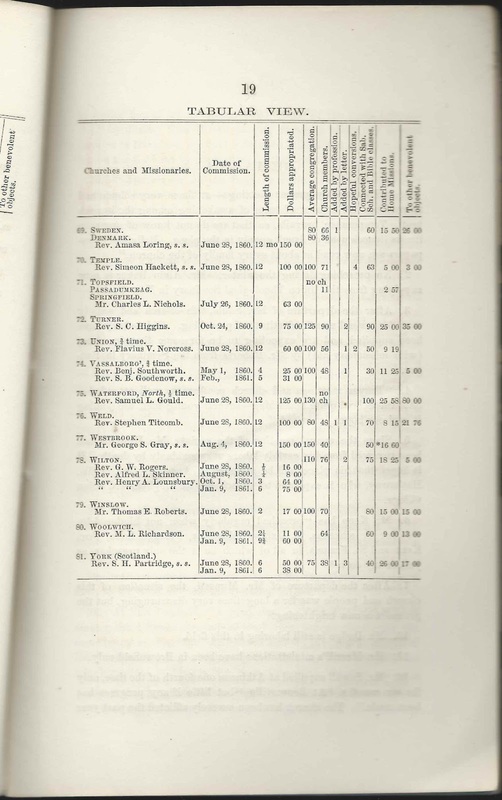 Elbridge Knight, s.s.
Westbrook Mr. George S. Gray, s.s.
Windsor - 1/4 time, and Monmouth - 3/4 time Rev. Henry S. Loring, s.s.
Y York (Scotland) Rev. 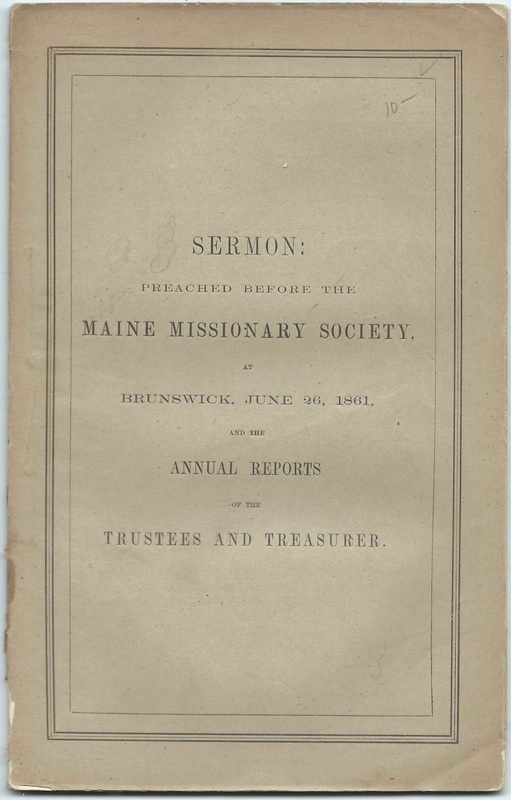 S. H. Partridge, s.s.
Alphabetical list of the ministers and laymen serving Maine missions supported by the Maine Missionary Society. 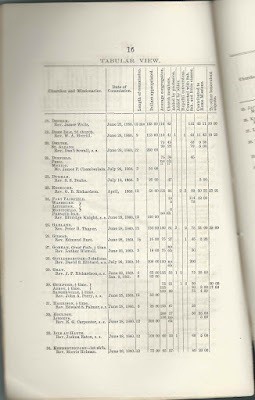 Again, refer to pages 20-26 of the online version of this booklet to view the numbered remarks that correspond to the numbered towns. There's interesting genealogical content in the remarks. If you have information to share on any of the men mentioned above, please leave a comment or contact me directly.